« size of an alley! 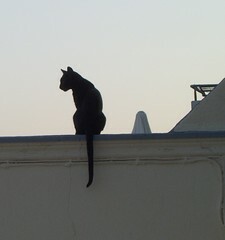 Even the sleek Greek cats emerge from the windy alleys to occupy favourite perches to supervise the sunset. This scribble was published on Sunday, September 7th, 2008. You can follow any banter on this scribble with the RSS 2.0 feed. You can share your inspired musings after typing the anti spam word near the bottom of the page. But no Pinging because its too naughty.